Southern Bluefin Tuna are highly migratory pelagic fish. In Australian waters they range from northern NSW around southern Australia to northwestern Australia. They tend to form large surface schools in offshore waters off southern Australia at certain times of the year. Overfishing has drastically reduced its numbers. 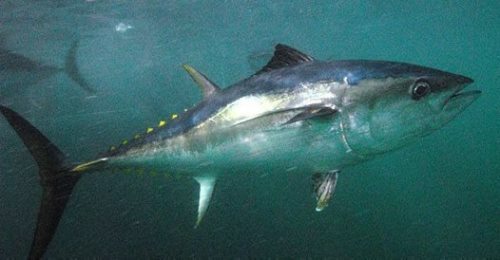 Southern Bluefin Tuna can reach a maximum length of 2.35 metres and can attain a weight of around 200kg, but rarely exceed 100kg in Australian waters. Southern Bluefin Tuna are a member of the family Scombridae and are recognised by their relatively short pectoral fins and robust body. Their upper bodies are blackish-blue and the underside is a silver colour. Juvenile and adult Southern Bluefin Tuna are opportunistic feeders that feed mainly on squid, crustaceans, fish and planktonic animals. Longtail Tuna (Thunnus tonggol) are similar in appearance to Southern Bluefin Tuna, but can be distinguished by their shorter pectoral fins and dark caudal keels.